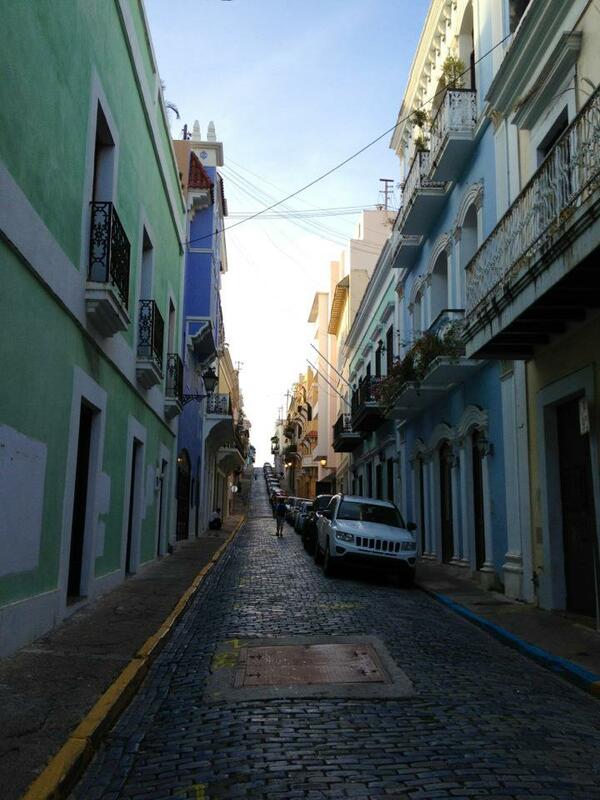 Hello and Goodbye Old San Juan! After a second restful night in our hotel rooms, we woke up early Friday morning, excited for another snorkeling trip! We ate another quick breakfast at El Mason, this time struggling less to order off of the Spanish menu. With Santos’ help finding the beach, we swam along coral which looked very different than what we were used to in Culebra. There was much more sandstone and waters was more shallow as well. Many of us found the coral to be a little too close for comfort, especially since the current was strong, but managed to enjoy the close up view nevertheless. Wendy, Jen, and a few of the other students had the pleasure of seeing an octopus up close! Those who did not see the octopus had a lot of fun swimming alongside a large school of fish, and seeing a glimpse of a very deep blue ocean where the coral ended. After more bonding on the beach while we were drying off, we rushed back to the hotel to quickly shower and finish packing. A yellow school bus picked us up, and we were on our way to San Juan. Hunger pains quickly interrupted our trip so we stopped to grab lunch at a restaurant along the way. Perhaps we enjoyed our food too much, because our lunch was far from short. We were all savoring the food and conversation so much, we lost track of the time. We all loaded back into the bus, bellies satisfied, and continued on our way. Two hours or so later, we arrived in San Juan. We were dropped off, and carried our luggage through the cobblestone streets of old San Juan as we made our way to our final destination. The hotel was, as Wendy put it, ‘a hole in the wall’ and a great find. Many of the students posed in the chic lobby while waiting for our room assignments. We were given free time after we put our luggage in the rooms to tour the town. Groups of two to four split off to explore the narrow streets and plethora of souvenir shops. The souvenir shopping was particularly humorous considering many of the “Puerto Rican” products labels proudly saying they were made in Indonesia, China, or Turkey. We met up in front of the hotel at around seven pm to attend dinner at a Caribbean and Indian fusion restaurant that last year’s class also attended. The dinner portions were huge and the food was a fun combination of the two cultures. It was evident at dinner how significantly closer we grew as a group and it was hard to imagine that this time tomorrow we will be on a flight back to the marine lab. How quickly time flies! At one point, loud music echoed throughout the restaurant as a belly dancer emerged from doorway in the restaurant. She danced around everyone shaking her hips and doing as belly dancers do. We were all very impressed by her animated facial expressions and ability to draw in audience participation. She continued to make appearances every so often during the course of our meal. Just as we were finishing our desserts, she came out a final time and inspired Abi, Katrina, Alyssa and Natalie to join in her belly dancing routine. 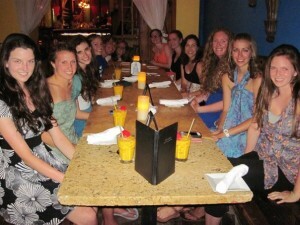 After dinner, the students either stayed in their hotel rooms, or checked out old the night life old San Juan had to offer. Though the city was very lively at night, the majority of the students did not stay out for too long because they were so exhausted. Everyone was very reluctant to leave Puerto Rico, even though it was the last night. So many memories were made in a short ten days. It was an experience that will not be soon forgotten. Tomorrow we will have the morning to explore old San Juan a little more before catching our flight back to the states.